One of the best podcast ever. 16 years ago, Gimlet Media CEO and founder Alex Blumberg made a promise that he didn’t keep. And it’s been eating at him ever since. In this season finale, Jonathan sets out to clean up his boss’s mess.<br><br><strong>Credits<br></strong>Heavyweight is hosted and produced by Jonathan Goldstein.<br>This episode was also produced by Peter Bresnan, Kalila Holt, and Stevie Lane.<br>Editing by Jorge Just, with additional editing by Alex Blumberg.<br>Special thanks to Emily Condon, Lynn Levy, Kimmie Regler, Amanda Melhuish, Mia Bloomfield, Phoebe Flanigan, Jasmine Romero, Matthew Boll, and Jackie Cohen.<br>The show was mixed by Bobby Lord.&nbsp;<br>Music by Christine Fellows and Bobby Lord. Our theme song is by The Weakerthans courtesy of Epitaph Records, and our ad music is by Haley Shaw. <em>Russian Ark</em> is a cinematic masterpiece. Dozens of sets, thousands of actors, years of planning. It’s a perfectly executed work of art. Almost. In this episode, Jonathan sets off to find the one guy who ruined it for everyone.<br><br><strong>Credits</strong><br>Heavyweight is hosted and produced by Jonathan Goldstein.<br>This episode was also produced by Stevie Lane, Peter Bresnan, and Kalila Holt.<br>Editing by Jorge Just, with additional editing by Alex Blumberg.<br>Special thanks to Emily Condon, Sruthi Pinnamaneni, and Chris Neary.<br>The show was mixed by Bobby Lord.&nbsp;<br>Music by Christine Fellows, John K Samson, Blue Dot Sessions, Michael Hearst, Bobby Lord, Y La Bamba, Michael Charles Smith, Graham Barton, Hakan Eriksson, Katie Mullins, and Virginia Violet and the Rays. Our theme song is by The Weakerthans courtesy of Epitaph Records, and our ad music is by Haley Shaw. Ten years ago, Rachael had a baby. She never told the father. All these years later, she thinks it’s about time she did.<br><br><strong>Credits</strong><br>Heavyweight is hosted and produced by Jonathan Goldstein.<br>This episode was also produced by Kalila Holt, Peter Bresnan, and Stevie Lane.<br>Editing by Jorge Just, with additional editing by Alex Blumberg.<br>Special thanks to Emily Condon, Katelyn Bogucki, Andrew Goldberg, Rachel Ward, and Jackie Cohen.<br>The show was mixed by Bobby Lord.&nbsp;<br>Music by Christine Fellows, John K Samson, Blue Dot Sessions, Bobby Lord, Michael Charles Smith, Hew Time, and Benny Reid. Our theme song is by The Weakerthans courtesy of Epitaph Records, and our ad music is by Haley Shaw. When Soraya was in college, her favorite professor hired her to help research a book she was writing. But when she fell into a deep depression and dropped out of school, she abandoned both the book and the professor who’d shown her so much kindness. Now, with Jonathan’s help, Soraya wants to make things right—with a grand gesture.<br><br><strong>Credits<br></strong>Heavyweight is hosted and produced by Jonathan Goldstein.<br>This episode was also produced by Peter Bresnan, Kalila Holt, and Stevie Lane.<br>Editing by Jorge Just, with additional editing by Alex Blumberg.<br>Special thanks to Emily Condon, Jasmine Romero, Mathilde Urfalino, Amber Davis, B.A. Parker, and Jackie Cohen.<br>The show was mixed by Bobby Lord.&nbsp;<br>Music by Christine Fellows, Blue Dot Sessions, Chris Zabriskie, Hew Time, and Bobby Lord. Our theme song is by The Weakerthans courtesy of Epitaph Records, and our ad music is by Haley Shaw. Joey recently had a very bad day, all due to awkward misunderstandings. So now, he's enlisted the help of Jonathan "Debonair" Goldstein and Jonathan’s friend Gregor to redo the day and set things right.<br><br><strong>Credits</strong><br>Heavyweight is hosted and produced by Jonathan Goldstein.<br>This episode was also produced by Kalila Holt, Peter Bresnan, and Stevie Lane.<br>Editing by Jorge Just, with additional editing by Alex Blumberg.<br>Special thanks to Emily Condon, Flora Lichtman, PJ Vogt, Saidu Tejan-Thomas, Grace Hawkins, and Jackie Cohen.<br>The show was mixed by Bobby Lord.&nbsp;<br>Music by Christine Fellows, John K Samson, Blue Dot Sessions, Bobby Lord, and Y La Bamba. Our theme song is by The Weakerthans courtesy of Epitaph Records, and our ad music is by Haley Shaw. Sven was on a jury that sentenced a man named Paul Storey to death. He's regretted it ever since. Then, eight years later, Sven gets an email from Paul’s mother.<br><br>The original article that Maurice Chammah reported with Sven about his experience on the jury: https://www.themarshallproject.org/2016/03/10/my-regrets-as-a-juror-who-sent-a-man-to-death-row<br><br><strong>Credits</strong><br>Heavyweight is hosted and produced by Jonathan Goldstein.<br>This episode was also produced by Stevie Lane, Peter Bresnan, and Kalila Holt.<br>Editing by Jorge Just, with additional editing by Alex Blumberg.<br>Special thanks Emily Condon, Maurice Chammah, Emanuele Berry, Caitlin Kenney, Jon-Mikel Tuttle-Gates, Amanda Marzullo, Mike Ware, Emily Fallis, Brian Reed, Sean Cole, Diane Wu, Christopher Swetala, Ira Glass, the rest of our friends at This American Life, and Jackie Cohen.<br>The show was mixed by Bobby Lord.&nbsp;<br>Music by Christine Fellows, John K Samson, Michael Hearst, Blue Dot Sessions, and Bobby Lord. Our theme song is by The Weakerthans courtesy of Epitaph Records, and our ad music is by Haley Shaw. When Skye was in middle school, her best friends showed up at her home one night and wrote “f*ck you” on her garage door. After that, they never spoke again. Now Skye has a son entering middle school, and he can’t believe his mom never asked her friends why they did it. So, thirty years later, Skye and her son set off to find out.<br><br><strong>Credits</strong><br>Heavyweight is hosted and produced by Jonathan Goldstein.<br>This episode was also produced by Kalila Holt, Peter Bresnan, and Stevie Lane.<br>Editing by Jorge Just, with additional editing by Alex Blumberg.<br>Special thanks to Emily Condon, Devon Taylor, Annika Pillsbury&nbsp; and Jackie Cohen.<br>The show was mixed by Bobby Lord.&nbsp;<br>Music by Christine Fellows, John K Samson, Bobby Lord, and Edwin, with additional music by Blue Dot Sessions, Michael Hearst, and Hew Time. Our theme song is by The Weakerthans courtesy of Epitaph Records, and our ad music is by Haley Shaw. Rob remembers breaking his arm as a kid. But the rest of his family says it never happened. Did he break his arm? The answer will determine Rob’s sanity.<br><br><strong>Credits</strong><br>Heavyweight is hosted and produced by Jonathan Goldstein.<br>This episode was also produced by Kalila Holt, Peter Bresnan, and Stevie Lane.<br>Editing by Jorge Just, with additional editing by Alex Blumberg.<br>Special thanks to Emily Condon, Phia Bennin, BA Parker, Matthew Nelson, Sandra Corddry, Maximum Fun, and Jackie Cohen.<br>The show was mixed by Bobby Lord.&nbsp;<br>Music by Christine Fellows and Bobby Lord, with additional music by Blue Dot Sessions, Michael Hearst, and Hew Time. Our theme song is by The Weakerthans courtesy of Epitaph Records, and our ad music is by Haley Shaw. During a visit back home, Jonathan’s mother inadvertently admits something that forces him to question his past. In this season finale, Jonathan turns the mic around on himself for one of the more personal episodes of the series.<br><br><strong>Credits</strong><br>Heavyweight is hosted and produced by Jonathan Goldstein.<br>This episode was also produced by Kalila Holt. The senior producer is Kaitlin Roberts.<br>Editing by Jorge Just, Alex Blumberg, and Wendy Dorr.<br>Special thanks to Emily Condon, Emanuele Berry, Pat Walters, and Jackie Cohen.<br>The show was mixed by Kate Bilinski.&nbsp;<br>Music by Christine Fellows and John K Samson, with additional music by Y La Bamba, Caspar Babypants, Michael Charles Smith, and Blue Dot Sessions. Our theme song is by The Weakerthans courtesy of Epitaph Records, and our ad music is by Haley Shaw. When Christina was in 11th grade, her foster mother made her quit playing basketball. After that, she felt like her life never got back on course. And so, she’s always wanted to ask her foster mother: why’d you make me quit?<br><br><strong>Credits</strong><br>Heavyweight is hosted and produced by Jonathan Goldstein.<br>This episode was also produced by Kalila Holt. The senior producer is Kaitlin Roberts.<br>Editing by Jorge Just, Alex Blumberg, and Wendy Dorr.<br>Special thanks to Emily Condon, Stevie Lane, and Jackie Cohen.<br>The show was mixed by Kate Bilinski.&nbsp;<br>Music by Christine Fellows, John K Samson, and Edwin, with additional music by Blue Dot Sessions and Hew Time. Our theme song is by The Weakerthans courtesy of Epitaph Records, and our ad music is by Haley Shaw. Last season’s episode, "Gregor," led to an unfortunate event that Jonathan could’ve never predicted. In this pre-season episode, he tries to set things right.<br><br>Heavyweight’s second season begins October 26th.<br><br><strong>Our Sponsors</strong><br><a href="http://mvmt.com/heavyweight">MVMT Watches</a> | <a href="http://sundancenow.com">Sundance Now</a> | <a href="http://spotify.com/podcasts">Spotify</a> | <a href="http://hellofresh.com">Hello Fresh</a><br><br><strong>Credits</strong><br>Heavyweight is hosted and produced by Jonathan Goldstein.<br>This episode was also produced by Kalila Holt. The senior producer is Kaitlin Roberts.<br>Editing by Alex Blumberg and Jorge Just.<br>Special thanks to Emily Condon, Stevie Lane, Wendy Dorr, Kate Parkinson-Morgan, and Jackie Cohen.<br>The show was mixed by Matthew Boll with assistance from Kate Bilinski.&nbsp;<br>Music by Christine Fellows and John K Samson, with additional music by Y La Bamba, Blue Dot Sessions, Hew Time, and Caspar Babypants. Our theme song is by The Weakerthans courtesy of Epitaph Records, and our ad music is by Haley Shaw. Galit was Jonathan’s first girlfriend. When she dumped him, he cried a lot and then locked away his emotional vulnerability in a safe for the next several decades. In this episode, Galit sends Jonathan a Facebook message asking if he’d like to meet up.<br><br><strong>Our Sponsors</strong><br><a href="http://gimlet.media/RAMailchimp">Mailchimp</a> – More than 12 million people use MailChimp to connect with their customers, market their products, and grow their businesses every day.<br><br><a href="http://gimlet.media/RASquarespace">Squarespace</a> – The easiest way to create a beautiful website, portfolio or online store. Use the offer code “HEAVYWEIGHT” to get 10% off your first purchase.<br><br><a href="http://gimlet.media/HWWealthsimple">Wealthsimple</a> – Investing made easy. Get your first $10,000 managed for free.<br><br><strong>Credits</strong><br>Heavyweight is hosted and produced by Jonathan Goldstein.<br>This episode was also produced by Chris Neary and Kalila Holt. Our senior producer is Wendy Dorr.<br>Editing by Alex Blumberg, Paul Tough, and Jorge Just.<br>Special thanks to Emily Condon, Stevie Lane, John K Samson, and Jackie Cohen. <br>The show was mixed by Haley Shaw. <br>Music for this episode by Christine Fellows, with additional music by Frisco J, Y La Bamba, Keen Collective, Hew Time, and Katie Mullins. Sam Kogon’s song “My Love It Burns” can be found <a href="https://samkogon.bandcamp.com/">here</a>. Our theme song is by The Weakerthans courtesy of Epitaph Records, and our ad music is by Haley Shaw. Years ago, Tony messed up his relationship with each of his three godchildren owing to three difficult chapters in his life. Now, childless and single in his late 40’s, and fearing he may never have kids of his own, Tony wants to win them back.<br><br><strong>Our Sponsors<br></strong><a href="http://gimlet.media/RAMailchimp">Mailchimp</a> – More than 12 million people use MailChimp to connect with their customers, market their products, and grow their businesses every day.<br><a href="http://gimlet.media/SAHelloFresh">Hello Fresh</a> – To get $35 off your first week of deliveries visit <a href="http://gimlet.media/SAHelloFresh">hellofresh.com</a> and enter promo code “HEAVYWEIGHT”<br><a href="http://gimlet.media/HWWealthsimple">Wealthsimple</a> – Investing made easy. Get your first $10,000 managed for free.<br><br><strong>Credits<br></strong>Heavyweight is hosted and produced by Jonathan Goldstein.<br>This episode was also produced by Chris Neary and Kalila Holt. Our senior producer is Wendy Dorr.<br>Editing by Alex Blumberg and Jorge Just. &nbsp;<br>Special thanks to Emily Condon, Anna Asimakopulos, and Jackie Cohen.&nbsp;<br>The show was mixed by Haley Shaw.&nbsp;<br>Music for this episode by Christine Fellows, with additional music by John K Samson, Michael Smith, Wonderly, Blue Dot Sessions, and Hew Time. Our theme song is by The Weakerthans courtesy of Epitaph Records, and our ad music is by Haley Shaw. Jonathan watched a short experimental video in college in which a little girl sat in silence while her parent sobbed. Now, Jonathan wants to know if that girl is okay.<br><br>You can find Maxi Cohen's website here: <a href="http://www.maxicohenstudio.com/">http://www.maxicohenstudio.com/</a><br><br><strong>Our Sponsors<br></strong><a href="http://gimlet.media/HWCASPER">Casper</a> - Get $50 towards any Casper Mattress purchase by visiting <a href="http://gimlet.media/HWCASPER">casper.com/heavyweight</a> and using the offer code "HEAVYWEIGHT".<br><br><a href="http://gimlet.media/RAMailchimp">Mailchimp</a> – More than 12 million people use MailChimp to connect with their customers, market their products, and grow their businesses every day.<br><br><a href="http://gimlet.media/HWWealthsimple">Wealthsimple</a> – Investing made easy. Get your first $10,000 managed for free.<br><strong><br></strong><br><strong>Credits<br></strong>Heavyweight is hosted and produced by Jonathan Goldstein.<br>This episode was also produced by Chris Neary and Kalila Holt.&nbsp; Our senior producer is Wendy Dorr.<br>Editing by Alex Blumberg and Jorge Just.&nbsp; <br>Special thanks to Emily Condon, Caitlin Kenney, Peter Clowney, Michelle Harris, Dr. Susan Boulware at Yale Pediatric Endocrinology<em>,</em> Maxi Cohen, Jack Hitt, Jack Turban<em>, </em>Lida Drummond, Mario Falsetto, Peter Rose, and Jackie Cohen. <br>The show was mixed by Haley Shaw. <br>Music for this episode by Christine Fellows, with additional music by<em> </em>Chris Zabriskie, Blue Dot Sessions, Katie Mullins, Y La Bamba, Stratus, and Matthew Boll. Our theme song is by The Weakerthans courtesy of Epitaph Records, and our ad music is by Haley Shaw. Maybe you’ve laid awake imagining how it could have been, how it might yet be, but the moment to act was never right. 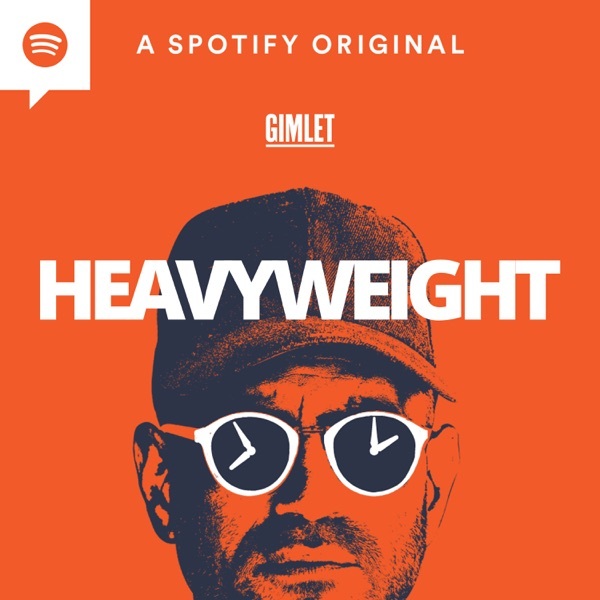 Well, the moment is here and the podcast making it happen is <em>Heavyweight</em>. Join Jonathan Goldstein for road trips, thorny reunions, and difficult conversations as he backpedals his way into the past like a therapist with a time machine. From Gimlet Media.The first episode premieres September 27.